Matt Grott started the 1996 season off slow at AAA Scranton-Wilkes Barre. His pitching coach Jim Wright helped correct what was wrong, according to The Wilkes Barre Times Leader. The effects showed themselves quickly as Grott went six innings in one game without giving up a run, The Times Leader wrote. "We were working just to sharpen my breaking ball a little and make my two-seam fastball a lot harder," Grott told The Times Leader. "I saw a lot of results." Grott had seen time in the majors the previous year in Cincinnati. He got into two games for the Reds early that May. His 1996 turnaround, though, couldn't get him back. Those two major league games ended up being his only major league games. Grott's professional career began in 1989, signed by the Athletics as an undrafted free agent out of Phoenix College in Arizona. He started with the Athletics in the rookie Arizona League. He went 3-1 in nine outings, five starts. He had a 2.31 ERA. In 1990, Grott saw three levels. He played at single-A Madison, high-A Modesto and AA Huntsville. Between them, he had 44 relief outings and a sterling 1.54 ERA and 17 saves. He started 1991 back at Huntsville. He went 2-9, with a 5.15 ERA. He picked up a save in an early June game. He got his second win in July, to eight losses. He was then traded at the deadline with another player to the Expos for Ron Darling. Grott played out the rest of 1991 at AA Harrisburg. He then moved to the Reds system in the minor league draft. He played 1992 at AA Chattanooga, then 1993 at AAA Indianapolis. He stayed at Indianapolis for 1994. 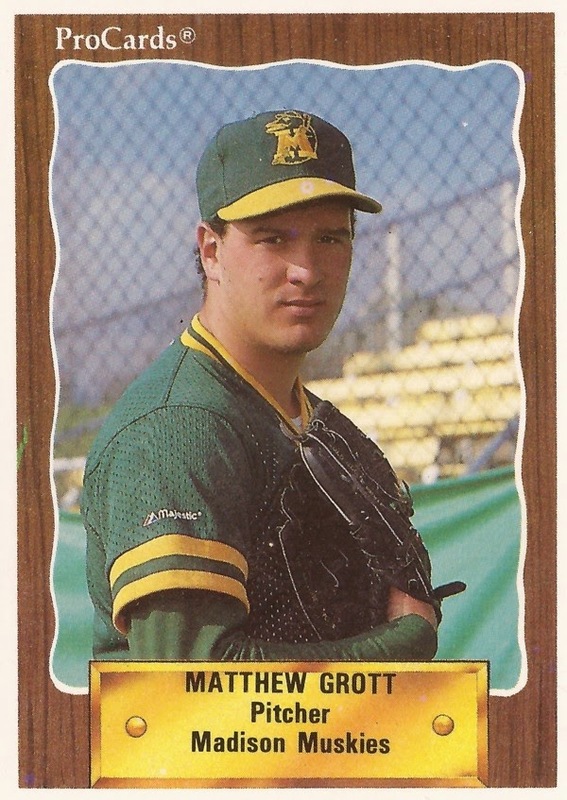 In the delayed spring of April 1995, Grott went two innings in a start, without giving up an earned run. He debuted with the Reds May 4. He went a third of an inning, giving one hit. He returned May 6. This time he went 1.1 innings, but he gave up four earned. Those two outings marked the extent of his major league career. Grott played out the year at Indianapolis. He moved to the Phillies system to start 1996, getting 27 outings at Scranton-Wilkes Barre. He moved mid-year to the Orioles system, playing at AA Bowie and AAA Rochester. He then played 1997 at AAA Tucson for the Brewers. In 55 outings, he had a 4.79 ERA. It was his final season as a pro. In 1996, after moving to the Orioles system, Grott tried to explain to The Times Leader the move to his new team. "I'd like to think my reputation as a good pitcher is what interested them," Grott told The Times Leader. "I think I've been successful the last three years, and I have experience."